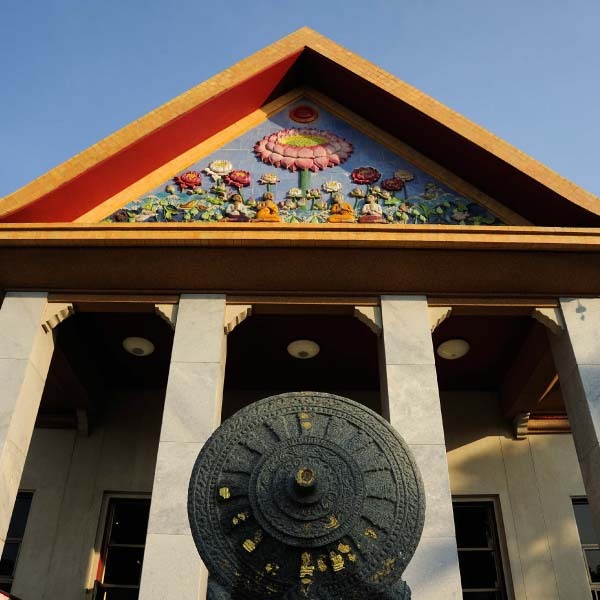 The Ubosoth Hall (main chapel or ordination hall) of Wat Yanasangvararam was built as a merit-making tribute to King Taksin the Great. It was modelled after the Vihara Rangsi building in Wat Bowannivet Vihara. Based on a geo-astrological belief, its location was specifically selected for prosperity and good fortune by having its front facing the sea and its back against the mountain. Her Royal Highness Princess Maha Chakri Sirindhorn presided over the Ubosoth Hall’s stone foundation laying ceremony on 24 March 1980. His Majesty King Bhumibol Adulyadej, accompanied by Her Majesty Queen Sirikit, Her Royal Highness Princess Maha Chakri Sirindhorn, and Her Royal Highness Princess Soamsawali, presided over the Tat Luk Nimit ceremony on 30 April 1982. On that occasion, all four members of the royal family planted four nutmeg (Myristica fragrans) trees around the boundary of Ubosoth Hall.